Everyone knows the black and red ant, but in fact, there are more than 12,000 species of this insect in the world. They are abundant and hard workers and travel in large colonies to build their home. These packs can range in different sizes from a dozen to millions. Are you having problems with a settlement on your premises? It is time to call in an ant exterminator Las Vegas provider to help eliminate this tribulation. Why—let us find out. One thing you do not want on your premises is ants moving in. They enter through the tiniest cracks and make it impossible to keep them out. Food particles and water attract the insect, and they love to roam around in the pantry, bathroom, or kitchen. Once they find food and water, these small critters leave pheromones to help the rest of the family to find their way and build a home. They adapt and can nest anywhere and once a camp is set up in the foundation and walls of a building or even the bushes or lawn it is challenging to get them out. 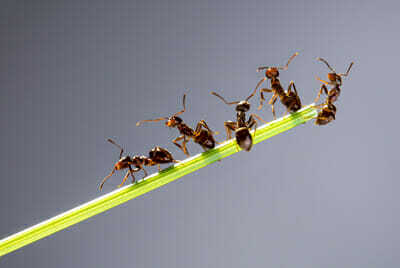 When ants feel threatened, they relocate and quickly find a new source of food. Do you have ants roaming around the home? Have you used home remedies and pesticides to remove them? The problem is that these types of methods only affect the ants you see and not the entire population. To rid these hard-working critters, you need to get to the root of the problem, and this is where we at Ranger Pest Control can help you. We can take care of all the different ants the Argentine ant, fire ant, carpenter ants, and odorous ants. Some ants such as the odorous and harvester ants are harmless and do not bite. But fire ants can bite and sting you with their venom. Are you allergic to bites and stings you best be careful around this critter? Another culprit that causes havoc in the home is the carpenter ant. They build their homes in damaged wood and structures of your home. They borrow through the lumber and make it weaker causing structural damage. A fact is that ants do not die quickly and the best is to eliminate the queen and eggs, and home remedies with DIY solutions cannot help. Hiring a pest control expert can help to remove a colony from your property. They are qualified and have years of experience to get your premises ant-free, safe, clean, and healthy. Call us today and let us take care of your ant problem the correct way.